Courtesans were refined, educated, intelligent, free women who lived privileges denied to all the other ones…. 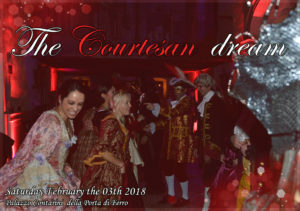 enter Palazzo Contarini della Porta di Ferro , enjoy a gourmet dinner, attend our Shows in the spirit of the most classical Venetian entertainments…. Discover The Dream of the Courtesan!! -Free Minuetto teacher to dance. Do you need more info about the event? Contact the event organizer: Sogno Veneziano Atelier.